Why New Year's Resolutions Fail! They fail because they are will power generated approaches. They are like affirmations: You consciously want to achieve a goal within a certain date, but subconsciously you know it is unrealistic, your subconscious mind says it is impossible, it is a too high expectation, so since the subconscious mind is way more powerful you can figure out who will win! The Power Of Intention Combined With A Healthy Positive Belief, Works Better Than Resolutions, And here is where Hypnosis Can Help! If you have tried to lose weight or reach your ideal level of fitness, using will power, discipline, commitment, different unrealistic diets & more, without reaching any concrete or long lasting result, you may want to learn that Hypnosis can help you lose the weight you want, in a safe, natural way, & gently, without deprivation, giving you realistic & permanent results. ​According to my experience, hypnosis is the most effective method for transformation that I am aware of. I became interested in hypnosis, because I had a compulsive craving for sweets and unhealthy food. I struggled with this problem for years. I tried several methods: different types of diets.I also tried changing eating habits, different nutrition type routines, ​powerful exercise regimes. ​​​None of these willpower based ​​​​approaches worked for me permanently. ​It was difficult and ​​distressful to apply them, to follow through. ​I started to research about hypnotherapy. ​​​Saw plenty of positive feedback, so I decided to try it. ​​Through hypnosis, I got rid of my problem permanently. It was easier than I had imagined it. I did not experience any feeling of deprivation. Gradually the routine of eating healthy, clean, food, became natural and even enjoyable! As a positive side effect, I lost few extra pounds, with no struggle, reaching the weight I was looking for. ​So I decided to study hypnosis in order to use it to help others! ​​HOW SUBCONSCIOUS WRONG BELIEFS CAN DETERMINE YOUR LIFE'S TREND! ​﻿﻿My comprehensive, Weight Loss Hypnosis program﻿﻿ consists of of 2 (or 3) sessions (2 SESSIONS MIN) of 75-90 mins each---done few days apart. However, every person is different, and one or few additional hypnosis shorter sessions, to achieve the desired results, may be needed. Is important for you to know that Hypnosis works best by repetition. Not only that, but each session (in my program) is different, bringing up and resolving different underlying issues, keys to Weight Gain, and also incorporating healing and reprogramming of limiting beliefs, making the program all encompassing, for long lasting and successful results.The rate for each session is still $140. (Rates as of 2011). However if paid by credit card is $145. NOTE: This is not a hourly rate, but for the whole session. If the sessions are purchased same day, at the first visit, there is a discount of $10.00 for the 2 session and of $16.00 for the 3 sessions . Optional recorded CD (w/MP3 File) - handed at end of 2nd session, is $19.00. 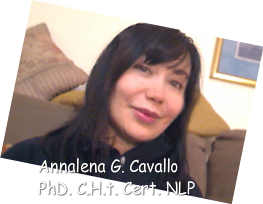 U.S. & International Copyrights © 2011-2012, Dr.Anna-Lena G. Cavallo, All Rights Reserved. No part of this web site content may be reproduced, stored in a retrieval system,or transmitted in any form or by any means.